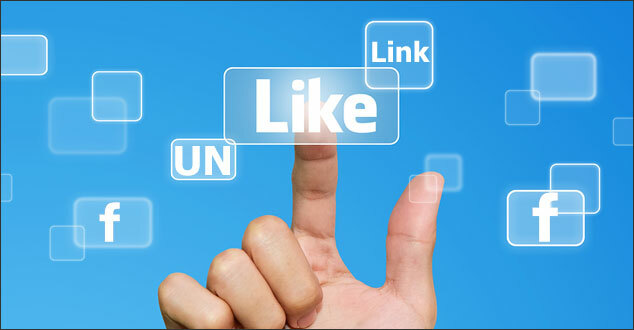 Have you clicked “like” on a link under a Facebook post and then decided that you actually do not want to like it? You may have clicked the like accidentally or you may have simply changed your mind and do not want others to see what you liked. How do you remove that “Like” from that link? 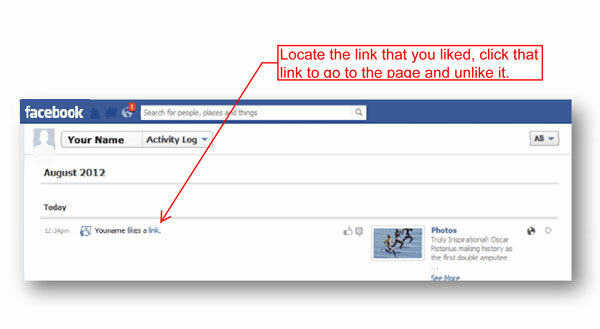 The first option is to locate the Facebook post or link that you recently liked. When you have located the post or link, find and click the “Unlike” link beneath it. The next page is your Activity List that includes all your Facebook activity since the beginning. Scroll down the list to locate the post or link that you want to unlike. 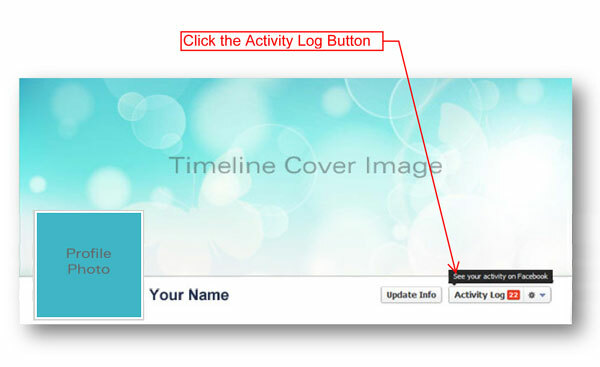 Note: Only you can see this Activity Log list when you are logged into your Facebook account. 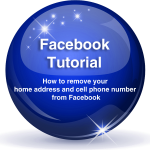 Would you like to keep your home address and phone numbers from prying eyes on Facebook personal profile? This tutorial will show you how to remove both. This is good information to have. So many times we can hit like in error and it may not be something we really WANT to like. Knowing how to “unlike” it is good to know. Thanks for all the helpfuld how to’s you share with us R & R! Thank you for taking the time to comment. You are right. There are times when we accidentally hit the “Like” link and then later, realize that we don’t want to actually like it. Thank you, Katherine, for stopping by. We hope the tutorial has been helpful. Sometimes managing a Facebook page can be like weeding a garden–you look and look and have to decide what to leave and what to pull! Thanks for this info–I will use it! Thank you for taking the time to comment! We are glad to hear that this tutorial has help! and if the like does nt appear in the activity log? Ron, thank you for visiting! If you do not see the “liked a link” in the activity log, you may like to try finding the link that you liked and unlike it. Unfortuntely I hit like on something that I do not want to like and it appears on my profile. When I pull down the activity log and likes, some are there but this one is not. I appreciate any help you can give. Were you able to determine how to remove this from you profile? One easy solution is to follow the link back to the original source and unlike it there. Dianne, I am sorry to hear that you are experiencing problems with removing the like from a link on Facebook. Have you tried refreshing the page to see if the like is removed? Terese, can you let me know where this mug shot was that you liked? Was it in your news feed or did you visit another page? There have been times when actions on Facebook do not work because of a roll out of a new feature. You may like to try closing your browser and clearing the Internet cache. Then, re-open your browser, log back in and try again. Please let me know how it goes. You are very welcome, Zoran. Thank you for stopping by. You are very welcome, Steve. I’m happy to hear that you found it helpful. Hi Vivian, thank you for stopping by. I wish that I could help. I have not seen this message before. Has this been resolved? unfortunately it has not been resolved. no one seems to know how to fix it and Facebook has no tech support. I even tried to set up a new account only to encounter the same problem. Vivian, I did a quick search about for the message that you are receiving and it looks like you are not alone. There are a number of people reporting receiving this message in forums. I have not seen one solution. 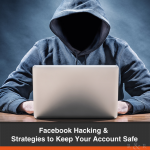 One discussion suggested that an IP address might be blocked for some reason by Facebook. This would make sense in your situation as your second account was receiving the same message. I hope that Facebook will respond and that the problem will resolved. Please let me know if it does get resolved. Thanks Robin – excellent clear instructions and helpful friendly individualized help! Best wishes! You are very welcome, Ralph. I’m glad to hear that these instructions have helped. Best wishes to you as well! I accidentally like a picture of my friend in facebook, but i quickly unlike it. I would like to know will he/she notice this? Hi Sam, thank you for stopping by. This will depend on your friend’s notification settings and if he/she were online. I hope this helps. Trying to clear my activity log and am running into old likes from at least two years ago to links that no longer exist (Squidoo, for example). It gives me the option to unlike, but the item in the activity log does not go away. I cannot unlike from wherever these links were liked because they were not liked on Facebook but shared on Facebook somehow. There are over two dozen to BlogTalkRadio, Hub Pages and more. I have done the clear cache, sign out and sign back in, but these do not go away. I’m sorry to hear that you are having problems with removing a like from a link on Facebook for Facebook likes on website posts. I tried to recreate what you are experiencing. I went to a page on a website and liked it. Then, I went to my activity log and located that like. There was no option to unlike the link, but I was able to “delete” the like from my Timeline from the drop down menu. Are you seeing the same option? Hi, Robin . . . these items were hidden from my time line for a very long time but now just simply do not delete (though the option is there). I even tried unhiding them to see if they would show up and I could delete them from my wall, but they do not show up. If you right click on the link to open in new tab/window, it takes you nowhere as the links no longer exist. I see no sense in having them cluttering up my activity log if they do not exist! Facebook has not responded to my numerous questions on this and I am getting frustrated. Thanks for any ideas you might have and for trying to recreate the problem to find the solution. You are welcome. I hope that you are able to find a resolution. Perhaps Facebook will make it easier for us to clean up the activity log. If I do find a solution, I will definitely let you know. Thanks! I had actually gone as far as to consider deactivating my account for a while to see if that detached all of these things in my activity log. You are so welcome, Linda! I hope a solution can be found so you don’t have to try that. If I do find an answer, I will let you know. Please let me know if you do, too?